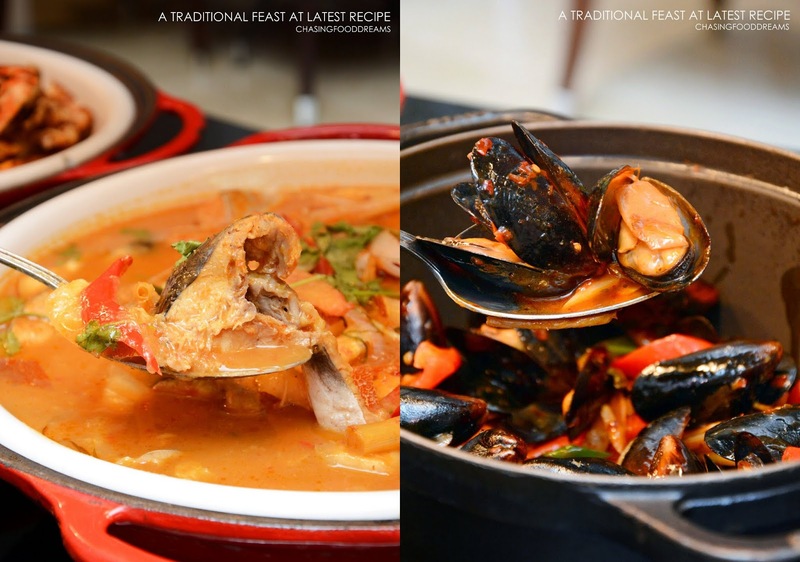 When it comes to a feast, Latest Recipe at Le Meridien Kuala Lumpur goes all out! It’s my first visit and it was a delicious sight to behold. Armed with a recent refreshed look, Latest Recipe boasts of a plethora of international fare gorgeously spread out at all the stations in the beautifully designed restaurant. The restaurant is cleverly spaced out with different levels and sections to offer diners privacy as well as a beautiful contemporary ambience. High ceilings, bright lighting and coupled with its vibrant color theme, Latest Recipe’s new refreshed look is attractive and cheerful yet stylish. 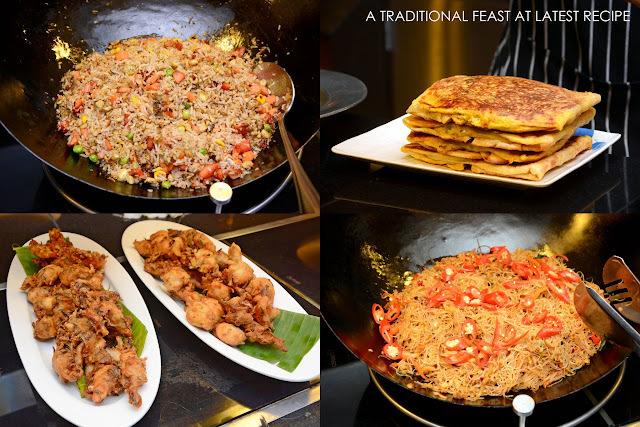 Latest Recipe 5-cuisine concept of Chinese, Malay, Indian, Japanese and Western continues to be a favorite with many foodies. 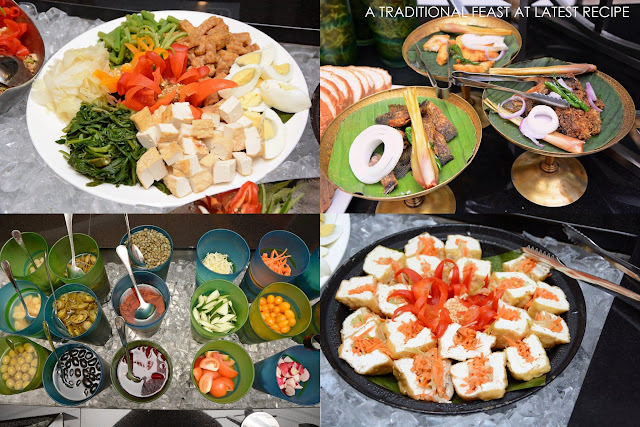 Live interactive cooking stations with the respective cuisine is constantly serving up hot and fresh food to ensure a delicious dining experience. 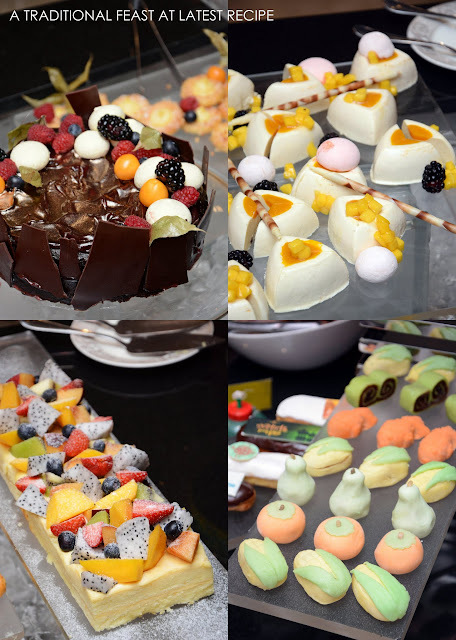 The dessert bar is scrumptious and offers a huge selections of beautiful desserts as well. 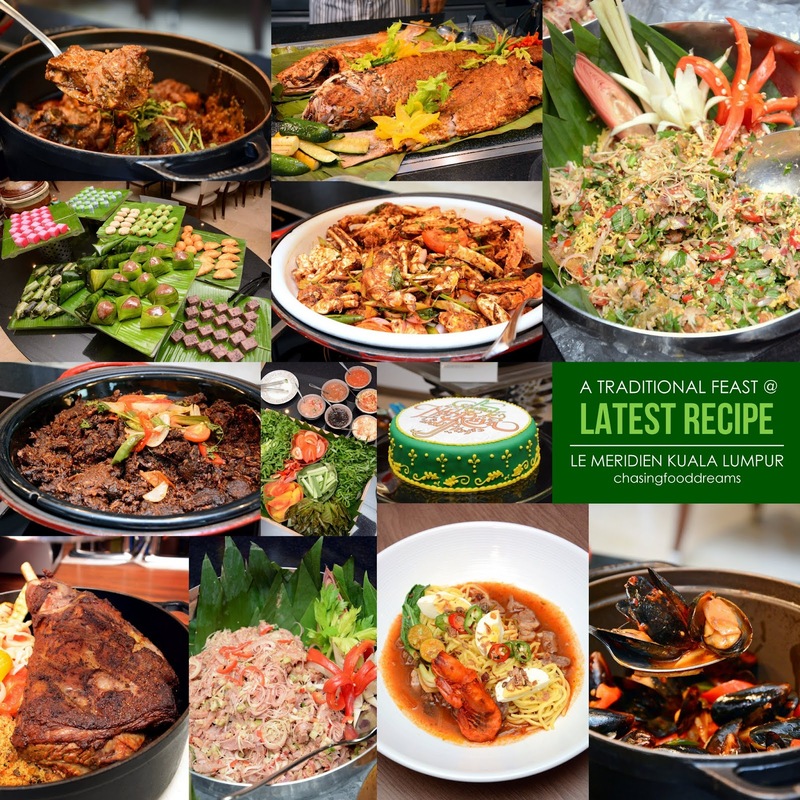 It is that time of the year for a traditional buka puasa feast of home-cooked food by Kedah-born Executive Sous Chef Budiman Bistari Bin Mohamed and his culinary team at Latest Recipe. The friendly and ever-grinning Chef Budiman has worked his way in the various culinary industry for more than 17 years. His philosophy on cooking is inspiringly filled with lots of love, to be respectful to the gifts of nature, to be passionate and generous with cooking and to unite everyone through food. With a few accolades under his belt, Chef Budiman continues to strive to serve diners with an unforgettable dining experience at Latest Recipe. For this holy month of Ramadhan, diners are treated to his traditional buka puasa feast of authentic Malaysian dishes with taste and flavours inspired by 10 states in the country. He is also bringing his family recipes to the table to share his childhood memories of authentic kampung dishes he grew up on. “My mother is my beloved role model and one of the main influences in my cooking. I will do my best to share her love through my dishes,” continues Chef Budiman. 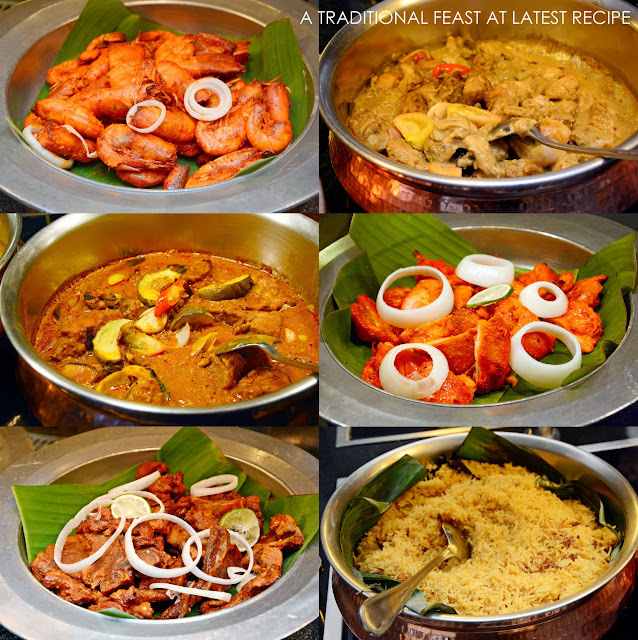 A Traditional Buka Puasa Feast includes several signatures of the festive month – Roasted Baby Lamb with 10 Spices served with garlic cumin sauce, Baked Sea Bass with Creamy Curry Sauce and Bird Eye Chili, Grilled Stingray and Sea Bass with Java Chili Paste and Oven-Roasted Spring Chicken with Sesame and Fenugreek Trigona Honey Sauce. The Roasted Baby Lamb is so tender and juicy, well marinated with a good dose of spices. It is simply a must-have at Latest Recipe. The Baked Sea Bass with Creamy Curry Sauce and Bird Eye Chili is another good choice as the fish is cooked nicely with a creamy and spicy sauce, perfect savored on its own or with rice and bread. From the 10 States in the country, traditional Malay dishes such as Lamb Bahmia with Dates & Green Peas, Deep Fried Sliced Beef with Java Chili Paste, Chicken Briyani, Patin Fish in Coconut Gravy with Turmeric-Preserve Durian Paste, Quail Rendang with Kaffir Lime Leaves, Flower Crab with Blackpepper, Kerutub Itik, Ikan Tenggiri Goreng Berempah, Udang Masak Dua Jintan Halia Muda, Rendang Kambing Pedas and more are available on daily rotation. The Australian Beef Rendang and 60 Days Grain Fed Chicken Rendang are another must-try as well. The Australian Beef Rendang oozed with great depths of spices beautifully harmonized through hours of slow cooking. The beef melts-in-the-mouth and has a rich and creamy flavour that makes me want to keep eating it. Available for takeaway, these are simply delicious! The Salad Bar is laden with lots of authentic Kerabus and salads together with other delights. Some of the Kerabus available are Salad Otak-otak Tenggiri dengan Mangga Muda, Kerabu Pucuk Paku dengan Kepah Sambal Lemak Kelapa Cili Padi, Young Papaya & Carambola Chili Paste, Fish and Prawn Terrine with Grated Chili Coconut Paste, Sliced Roasted Beef with Tamarind Chili Dip and more. 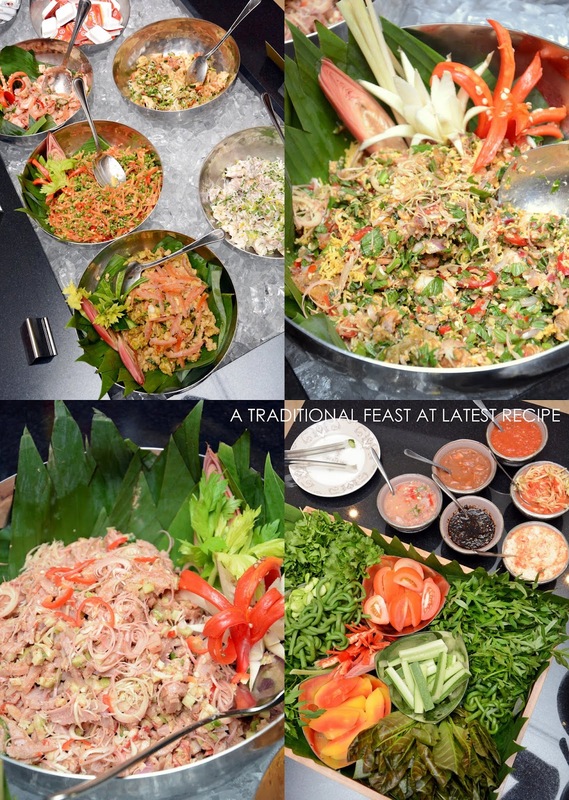 Savor other Malay appetizers like Pecal Desa, Tauhu Sumbat, Acar Limau, Popiah Basah, Nasi Ulam, Ulam with Assorted Sambals and various Ikan Masin together with Telur Masin and Aneka Keropok. Don’t miss sampling Mee Kak Lah, Chef Budiman’s signature Beef Soup Noodles! The flavours are amazingly complex but truly satisfying with lots of hot and sour notes. From the Western buffet, diners can enjoy a lavish spread of Seafood On Ice, Pasta Station, DIY Salad Bar and other Western dishes from the hot buffet counter. The Japanese station is a sure crowd-pleaser with its Sashimi offerings of Salmon, Butterfish and Octopus together with freshly fried Tempura Prawns, Fish & Vegetables and Teppanyaki of Beef, Prawn, Chicken and Fish served with Fried Garlic Rice and Sautéed Vegetables. The Chinese station showcases Dim Sum, varieties of Noodles, Fried Rice, Fried Hokkien Noodles and more. From the Indian station, a sumptuous spread of fresh baked Roti, Naan, Murtabak, Chicken Tandoori, Prawn Tandoori, Fish Tandoori, Lamb Chop Tandoori Briyani Rice, Curries, Chutneys and more will tantalize your senses with rich and robust spice flavours. 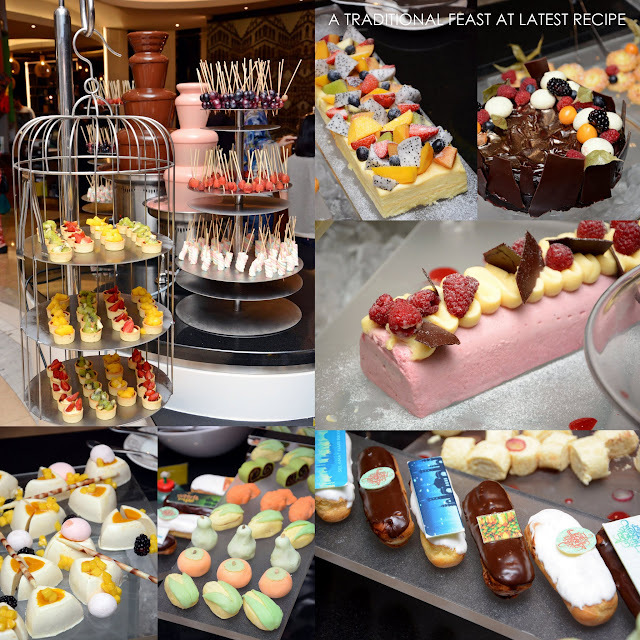 It’s a feast to enjoy to the fullest but do make sure to save some room for the awesome Dessert Bar filled with loads of savory and sweet treats. Indulge in traditional Malay desserts such as Apam Balik, Kuih Lompang Warna Warni, Kuih Seri Muka, Kuih Apam Gula Hangus, Bingka Jagung, Kuih Tepung Pelita, Kuih Koci, Lepat Pisang, Pulut Inti, Buah Kurma, Bubur Durian, Bubur Kacang Merah, Penget Keledek and more. 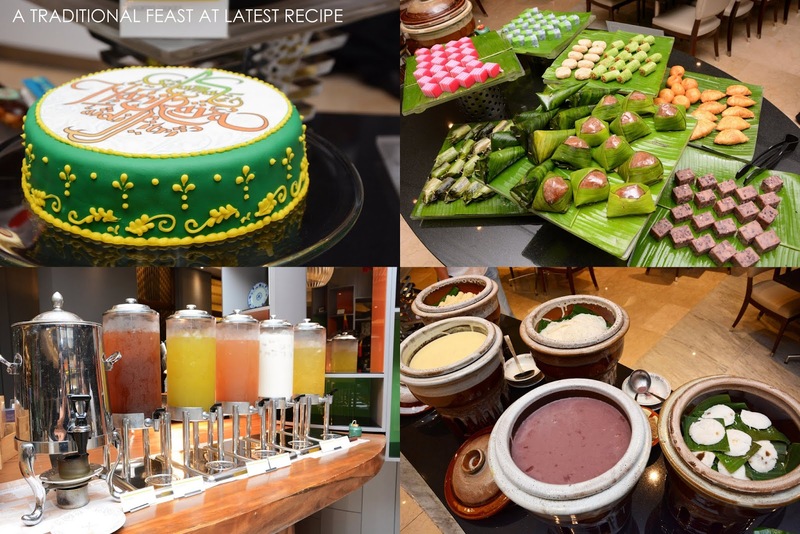 The buffet spread is inclusive of free flow of Date Juice, Sirap Bandung, Sugar Cane Juice, Iced Lemon Tea and hot Teh Tarik as well as ABC and Cendol Mamak. Other international desserts are even more luscious with lots of beautiful Cakes, Pastries, Eclairs, Mousse, Fruit Tarts, Dark Chocolate and Pink Chocolate Fountain and more. Savor fresh cook-to-order Belgian Waffles served with your choice of condiments or simply add on icy soft serve ice cream for extra indulgence! Young or old, many will also favor the candy bar filled with lots of sweet candies. Additionally SPG members will receive a 20% discount off total food bill. Festive Delights such as Roasted Baby Lamb Brushed with Arabic Spices, Australian Beef Rendang, 60-Day Grain Fed Chicken Rendang, Chocolate Chip & Dates Cake, Hari Raya Éclair and more are also available for order and take-away. For reservations, visit www.lemeridienkualalumpur.com/dining or email: dining.lmkl@lemeridien.com of call Dining Reservations at +603 2263 7434.